Trust us, you want this. A plate of black garlic. If you’re a sucker for the flavor of roasted garlic, black garlic is for you. This special garlic preparation, which is all the rage among chefs, is basically just roasted garlic times 1,000,000 in terms of flavor ― and roasted-ness. 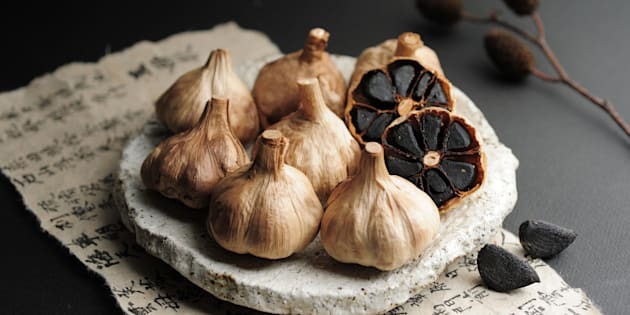 Black garlic starts off as regular whole head of garlic that is cooked at a temperature of 140 degrees Fahrenheit, in a humid environment, for nearly a month. The slow cooking process transforms the previously pungent cloves into soft, sweet, sticky and slightly acidic black or dark-brown garlic. It takes on a flavor you’ll want to add to everything. Garlic turns black when cooked for a long time at a low temp because of the Maillard Reaction. The Maillard Reaction occurs when sugars and amino acids in food react with heat and produce complex molecules (which then produce more complex molecules) until hundreds of various molecules are present. It’s what gives the brown sear on a steak when cooked or a char on vegetables when roasted. While the Maillard Reaction is often associated with things cooked at high heat, it actually happens at lower temps, too ― it just takes longer. And since black garlic cooks for so long, the Maillard Reaction has time to take place. If it’s so good, how do I get some? Good thinking. You definitely want to get your hands on some. If you’re feeling brave, you could try to make some. Bon Appetit suggests using a rice cooker ― but you won’t be able to use that cooker to make rice for an entire month. An easier way is to order it online at Black Garlic City. Or, you can look for it at your local Trader Joe’s. Once you get your hands on some, use it just as you would roasted garlic. And use it in everything. It’ll add that perfect umami flavor to all of your favorite things. You can use it to make aioli, making it possibly the best sandwich spread in the history of spreads. You can turn it into salad dressing to make salads great again. It even makes brownies better.